At the local Mardi Gras parade, April, dressed as a 17th century noblewoman “right out of the Three Musketeers,” suggests that the Turtles, who are walking the street “au natural”, should be in costume and should also read Dumas’ book. O’Neil just happens to have a copy on her and gives it to Leonardo, who reads it at the first opportunity. Leo is enthralled by the tale and tries to convince the other Turtles of the striking similarities between themselves and the Three Musketeers. Meanwhile, down in the Technodrome, while watching April O’Neil’s coverage of the Mardi Gras parade, Krang learns that the priceless Star of Brazil diamond, is, in fact, the long lost element of Impervium – a substance found only in Dimension X and was sent to earth as part of an experiment. Krang tells Shredder that with the Impervium once again in his possession he could create weapons unknown to the likes of man. Shredder wastes no time sending Rocksteady and Bebop up to the Earth’s surface to steal the gem. Back to the parade, Irma lures April into the jewelry store that has the Star of Brazil on display, just as Rocksteady and Bebop burst into the shop to steal the diamond. April contacts the Turtles who arrive to thwart the would-be bandits. While trying to recover the diamond, Leonardo is knocked unconscious and the stone goes flying out of the store and into a trash can only to be recovered by Irma, who does not recognize it as the world famous gem. 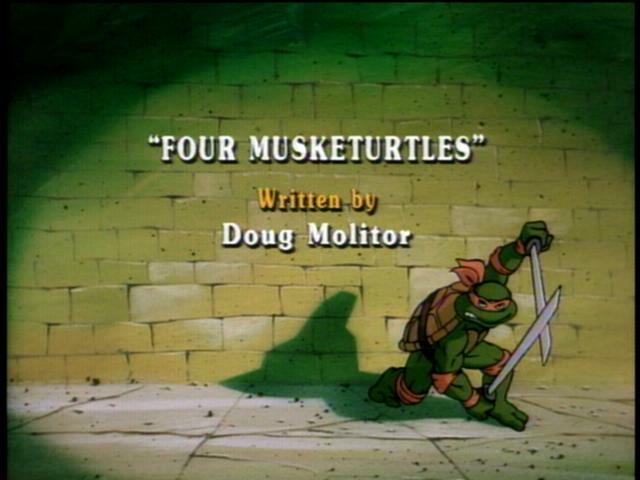 When Leo comes to, he believes that he, and the other three Turtles, are the famous Musketeers. Later, the Turtles hit the streets to locate the Star of Brazil diamond – dressed as the heroes of the Dumas’ book in order to humor Leonardo. Back at the Technodrome, Krang is very upset with Shredder’s latest failure and gives him one last chance to redeem himself and bring him the Impervium gem so that he can power his Force Field Generator and become invincible. But Shredder has had enough of Krang and steals the alien’s Force Field Generator, deciding that when he gets possession of the Star of Brazil he will keep it for himself. While Rocksteady and Bebop fail to find the diamond, Shredder runs into Irma, who is now wearing the diamond around her neck, and attempts to kidnap her. But before Shrehead can get away, the Turtles arrive. Leonardo chases the villain up to the top of a Mardi Gras parade float. April, aboard the Channel Six News Van Copter, tries to intervene, but she inadvertently provides Shredder with a means of escape. Shredder, Rocksteady and Bebop take April and Irma to the basement of the Channel Six News building where Shredder removes the diamond from Irma’s necklance and places it in the Force Field Generator and prepares to announce on live TV that he is the new “emperor” of the world. In the Channel Six News basement, Shredder’s power is usurped by Krang, who has arrived to repossess his stolen Force Field Generator. But before the alien can return to the Technodrome, Leonardo arrives and relieves him of the Star of Brazil. Krang orders Rocksteady and Bebop to fire upon Leo, causing him to fall to the floor from a distant height. The knock on the baffled terrapin’s head allows him to become Leonardo once again. Leo is soon joined by his fellow Turtles as they battle with Krang, Shredder, Rocksteady, Bebop and the NInja Foot Soldiers. Within minutes, Krang and company have retreated back to the Technodrome and the Star of Brazil, having fallen down a sink drain, is lost somewhere in the sewer system.